Where do B2B buyers get the information that make them buy? – They don’t open your e-mails or direct mailings. How do you reach your B2B buyers? But does that mean you reach your buyers? I am not talking about communicating with your buyers. I mean REACHING them, so they really feel happy to get their hands on the information you are giving them. So they position your brand as useful, knowledgeable, and trusted. And in the end put they you on their shortlist and buy from you. But what information do they want? Where do they search for it? Who needs what kind of information, and when? 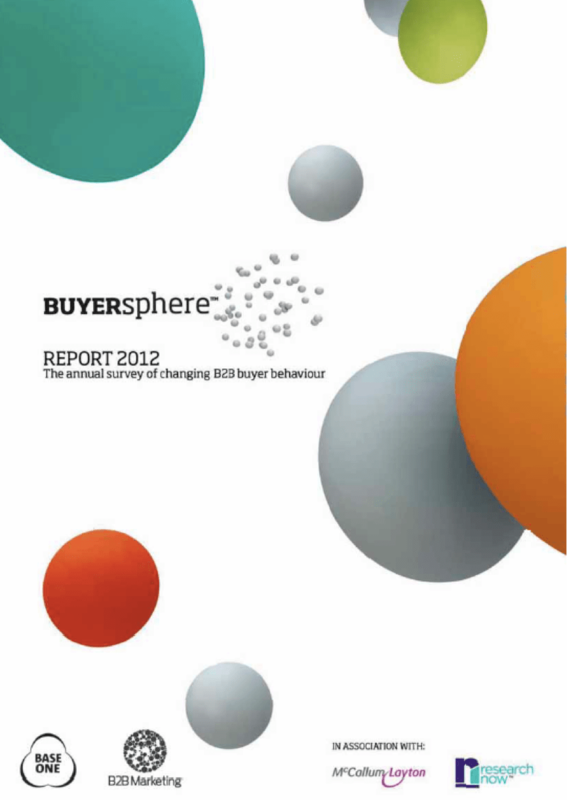 The 2012 Buyersphere survey is designed to bring answers to these questions based on the actual behavior of B2B buyers. It is based on surveys o B2B buyers in the main countries in Europe, but I like to think that they are valid to other parts of the world as well. Where do buyers get their information? How useful did they find each information channel? What kind of information do they use? How influential was that information? How do buyers use social media? When do buyers get in touch? How do they share information with others? What are the differences across European markets? One of my direct colleagues here @Newtec_satcom (yes, you Karl) wanted me to use this word ‘Amaaaazing’, so there you have it. For B2B buyers, word of mouth and web searches are the best ways of finding info. B2B buyers find most whitepapers and blogs via Google, but find out about most seminars by email. Use of Twitter amongst B2B buyers has reduced from 10% to 3% in the last 12 months. Twenty-something B2B buyers are TWICE as likely to use social media as 31-40 year olds. One of the most interesting findings of the 2012 Buyersphere Report is the change in buyer behavior noted from year to year. Things are changing more quickly than many of us imagine, and it is the marketers who correctly identify the trends who will be most effective in planning their communications. The 2012 Report showed a distinct increase on the previous year in terms of the sheer amount of content sought by buyers in the course of the buying process. This is good news for all those marketers who are investing in content programmes and thought leadership campaigns. Buyers want content more than ever and they are increasingly likely to find you via a search engine. Another great stat. Interesting too see is that online community sites are used during the final supplier selection. Remember that this is B2B, and not an end-user buying a digital camera. Striking number: 50% of the buyers use of Twitter in the early buying phase. 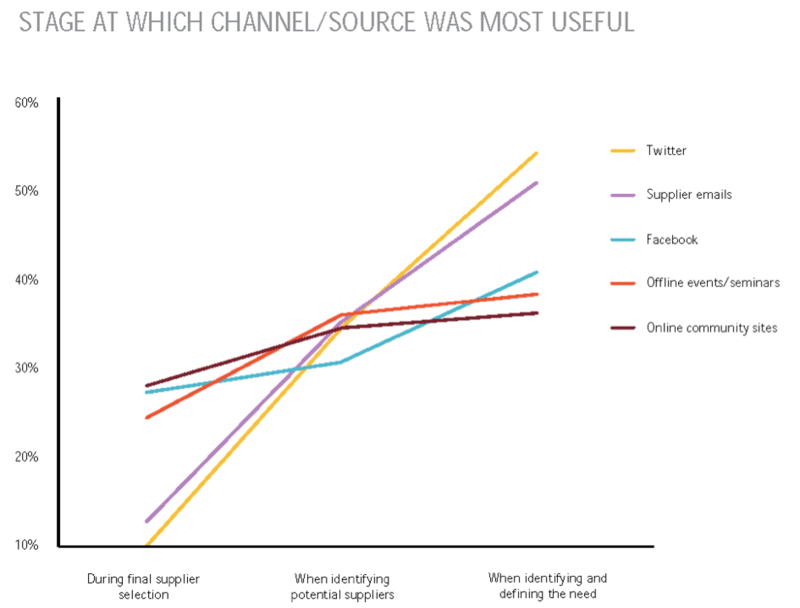 When do buyers make direct contact with suppliers? Nothing new here, but it might be new for you. Striking number : Buyers do not contact suppliers in the early phase, and only in 40% of the cases they will contact suppliers to make the final decision. Focus your marketing initiatives on providing relevant content to your buyers. Use this study to define what, where and when you will provide them with this content. Make sure your content is found on the web. Don’t neglect the traditional channels, like events, seminars & tradeshows. Social media is still on the rise in B2B, so make sure you understand it, and that you have a social media strategy linked with your content marketing strategy. Especially the decision makers of tomorrow are increasingly using this to get informed. If you like this study, and if you like this post, please share this post on your favourite social network. P.S. here’s the link to the full report : http://www.baseone.co.uk/beyond/Buyersphere%20report%202012.pdf. Go for it, you won’t regret it! Thanks for the comment Aaron. Interesting comment you make. Maybe you want to share more ?